So I got a little bored and decided to do a little question and answer through Twitter. I asked people for any random questions they might have. Here are the questions i got. 1. Where do you see yourself in 5 years time? In 5 years time i'll be 27 and i'd like to think i'd be married, either with a child or expecting :) I'd love to have my own house, car and a steady job. 2. What is your perfect Friday night? My perfect Friday night would have to be a girly night in with chocolate, pizza and films. 3. Can men and women ever just be friends? I honestly think men and women can just be friends. At college two of my best friends were male, they were like brothers to me. The meaning of life... to be honest i think the main reason for life is to pass on your genes. But that doesn't mean you can't have dreams and ambitions. I believe that we all have a certain path laid out for us but that different choices we make affect that path. 5. If you could be trapped on a desert island with any famous woman who would it be and why? 6. What baby names do you like? I love the names Jake, Lucas and Charlie for a boy. For a girl i love Emma, Daisy and Sophia. 7. What is your favourite memory? My favourite memory from my childhood was when me and dad used to sit and watch Star Trek every week cuddled up on the sofa. I never really liked it but loved spending time with him :D My favourite memory as a adult was at college when me and my friends used to play cards and eat chips during our free lessons, much fun was had!! My celebrity crush is Wentworth Millier, fell in love after watching Prison Break! 9. Once only opportunity for time travel, forward or back in time for you and why? My favourite animal is a Giant Panda. 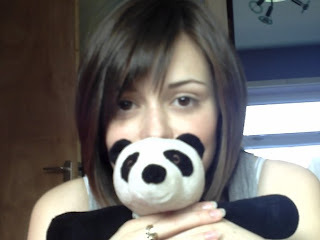 I have loved them ever since i can remember and own about a million panda related things from pj's to pens :D I'd also LOVE to go to China and work with them. Thank you to my twitter lovelies that asked a question!